Only two hours from Venice, Cortina is surrounded by the spectacular Dolomite mountains and was recently declared a UNESCO World Natural Heritage Area. 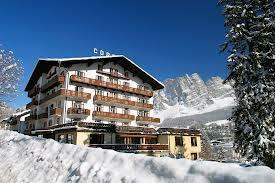 Cortina is also one of the best known Italian tourist destinations, renowned throughout the world for its exclusive charm, great events, glamour, elegant shops, excellent hotels and restaurants, and cosy mountain refuges. The majestic snow-capped Dolomite peaks leave you breathless with their unique formations and unparalleled beauty. Skiing is a great classic that never goes out of fashion in Cortina, with technically challenging and stimulating slopes for expert skiers as well as for beginners. The ski lift is only 300m from the hotel or a short ride on the free ski bus.